Our challenge this week for the Blogger's Challenge is called Alter It. The challenge is to take something and change it, like a home decor item, a candle, a vase, etc. This item is a little plaque that I found at a local thrift store. It was all of 25 cents. It was completely blank. I started by painting the front with blue acrylic paint, and the sides with peach acrylic paint. 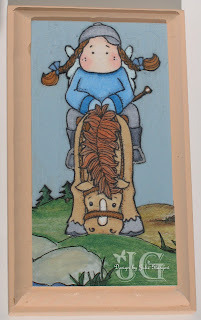 I stamped Tilda on Horseback on white cardstock and colored with Copics. I then cut the image out. The meadow scene is from a border that I have had around for quite a while. I believe it is made by My Mind's Eye. I attached these to the plaque using Modge Podge. My Modge Podge had started to dry out, so I just added a little water and it worked great. I then added a couple more layers of Modge Podge over the top. I plan to give this to my DD for her BDay. 14 comments that make blogging fun! Well, it is the 25th, and I have my second installment of my Christmas All Year Long challenge. In case you missed it in January, I am challenging you all to get a jump on your Christmas cards. If you are anything like me, I start thinking about cards in September, start my design in October, by November, life is really busy with all the holiday activities, and I am scrambling to actually get my cards done. I figure if I do a little each month, by November, I will be done and can relax about my cards. So here is my card for February. 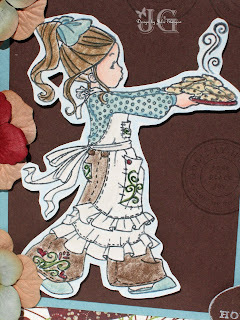 This card uses the image Cookie Girl from the Whiff of Joy stamp line. 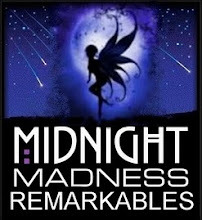 You can find this stamp at Roses On Paper. I have bought several stamps from Summer (the owner of Roses on Paper), and she is just wonderful. 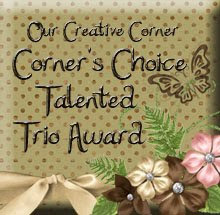 She also carries Prima Flowers and Magnolia stamps. 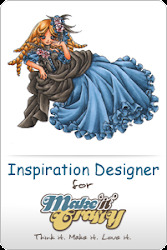 She has some wonderful designers as well. Go check out her site. I colored Cookie Girl using Prismacolor Pencils. I decided to venture away from my Copics for a day. I really like the soft look of the Prismacolor Pencils. To finish off my project, I used a hat pin with pearls and crystals for that extra touch. I hope you find inspiration to work on those Christmas cards early. Check back on March 25 for another Christmas inspiration card. Just a simple card today. I made this card for someone dear to me who lost someone dear to her. I used metallic pencil on white craft ink for the flower. 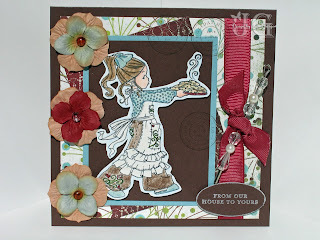 The flower is from Sweet N Sassy Stamps. It is called Special Women. The background paper is from a mat stack (stash). 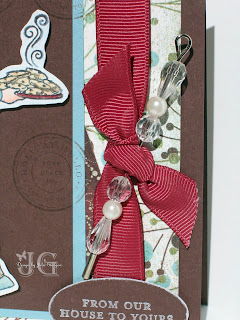 With Sympathy and the ribbon are from Stampin' Up! as well as the card stock (Perfect Plum and Pale Plum). 1 comments that make blogging fun! This creation was for a Magnolia Bling Contest. I must admit I did not win (rats) but thought I would share anyway. There are Shimmerz on Tilda and the flowers, Glitter on the Heart DSP and around the edge of the die cut, glitter and Copics on the Hodgepodge Hardware, heart-shaped bobbles, and rhinestones in the middle of the flowers. It was hard to get a good picture due to clouds, but this card really shines. 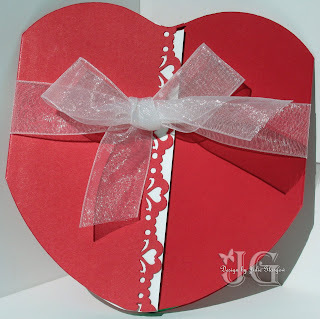 The challenge this week was to make a valentine. So, in honor of Valentine's Day and the new release at Our Craft Lounge, I made this card using Dr. Peanut from Our Craft Lounge. 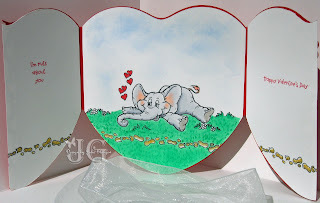 I used the heart template from the Creative Memories cutting system to cut out the heart. I used a Fiskars edger to cut the pattern along the edge of the flap. I colored Peanut with Copics and created the grass attempting to use the technique taught by Marianne on the blog I Like Markers. I used a sponge to sponge in the sky. I hope you all have a HAPPY VALENTINE'S DAY! 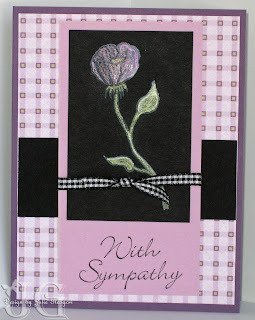 This card is for the Roses on Paper Challenge #5. Here are the details of the challenge. In honour of Summer's love of roses, your card must include at least one ROSE (think outside the square - doesn't have to be a stamp) Layout is your choice. 5 comments that make blogging fun! Last week was very busy, so I was unable to post much. Hopefully this week will be a little calmer. The stamp set is a Clear Impressions set by Provo Craft. This is another one of those stamp sets I have had for ages and never used. With my Copics, I am discovering so many new possibilities. I used a texture plate to create wood grain on the backgroundpaper. I used Close to Cocoa and brayered over the texture with Chocolate Chip ink. The tree was individual, so I stamped them as if going downhill and used a Micron pen to fill in the blanks. 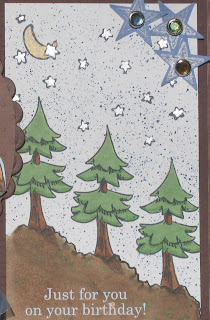 The stars and moon are colored with my silver and gold paint pen. I used a rub-on for the sentiment and the star on the button. It is so fun to re-discover stamps that you fell in love with so long ago. This one is for the family. Our daughter was in a skating exhibition today. This is in preparation for her competition next weekend (weather permitting). I am sharing the video to give her grandparents the ability to watch her skate from all over the country. Here is another page from my Owl Calendar. This page is from May, our birthday month. Our family has a ton of birthdays in May. Did this happen by chance? Not so much. I was bound and determined not to be 9 months pregnant in July or August in California, so we had good timing and a little luck. As it happens, there are others in the family with that same stroke of luck, and cousins share a birthday month. So, here is a page showing our birthday celebration last year. 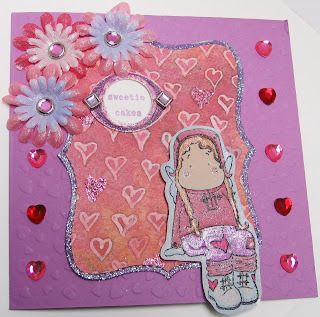 The stamp is from Sweet N Sassy Stamps. The papers are a variety of papers from a 4 x 6 paper pack. I used Copics to color the owl. The flowers are Prima's with a button center. I hope you have a wonderful Tuesday. 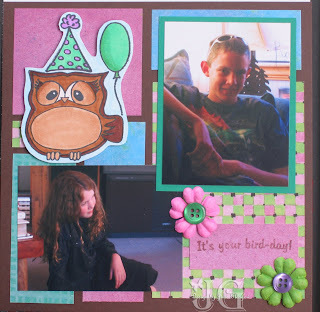 The stamp is Tilda with Lantern from Magnolia. 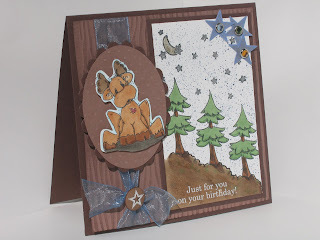 The paper is DSP from Stampin' Up! For the Scallop Circle, I used Spellbinders Scallop Circle Nestabilities. 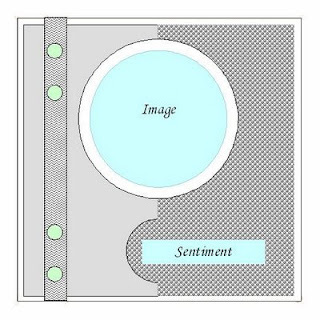 I used a large circle punch to punch out the circle image. I used little Prima flowers and Dew Drops. 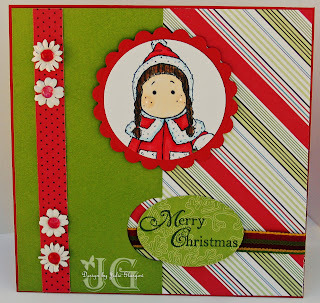 I punched out Merry Christmas with the Large Oval Punch, and layered a bit of ribbon underneath. As usual, I used Copics to color Tilda. I should note, this is a continuation of my attempt to get ahead on Christmas cards for this year. It will be nice to have a good number of cards completed and a nice variety.